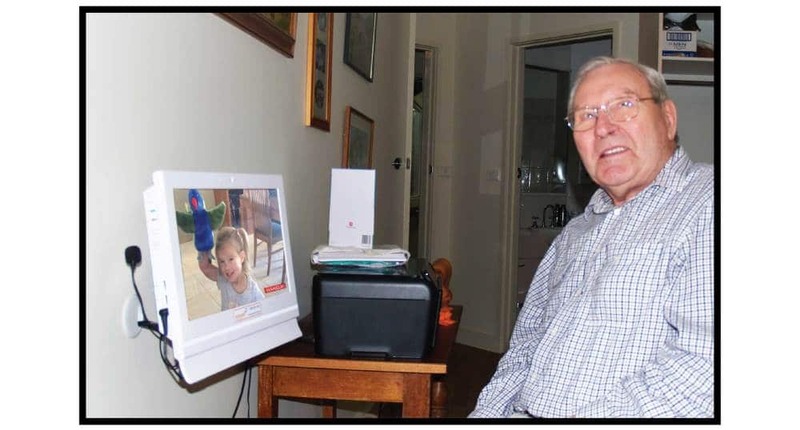 Aged Care and Allied Health workers are now recommending Videophone to socially isolated clients. Konnekt is demonstrating its touchscreen video phone at the ATSA Independent Living Expo in Sydney’s Showgrounds, enabling conference attendees to experience first-hand the simplicity of one-touch, face-to-face calling. Older adults and those with an impairment who live independently face a huge risk of social isolation, which research has linked to a range of ailments including depression, poor sleep and high blood pressure. Our Videophone is, quite simply, the world’s simplest! Even the elderly and those with dementia can make and receive face-to-face calls, thereby regaining some independence and maintaining that vital bond with family and friends. — Karl Grimm, CEO Konnekt Pty Ltd.
Konnekt is a Registered NDIS Provider. Occupational Therapists and other Allied Health professionals can therefore recommend Konnekt Videophone to clients with a disability who are feeling lonely, are in danger of social isolation, cannot use other assistive technologies such as tablets, or simply can no longer use a standard telephone. In addition, Konnekt is listed with selected MyAgedCare Providers who provide Case Management services, allowing seniors and families or care-givers to purchase, rent or trial the Konnekt Videophone using a government Home Care Package (HCP). Occupational Therapists are increasingly concerned with the impact of social isolation on their clients’ health. Recent research shows that face-to-face contact with family and friends — at least 3 times per week — can reduce social isolation and halve the risk of depression. The Konnekt Videophone provides OTs with a unique assistive technology, for those who struggle to use a tablet PC as a video communication aid, either due to old age, a lack of computer skills, or an impairment such as low vision, poor hearing or shaky hands. — John Nakulski, Director, Konnekt Pty Ltd. Learn more about Videophone. Learn how it can improve health and happiness, or contact Konnekt to learn how Videophone can help someone you help care for.